Watersheddles Cross, near Scar Top, on the Lancs-Yorks border. OS Grid Reference: SD 97121 38282. 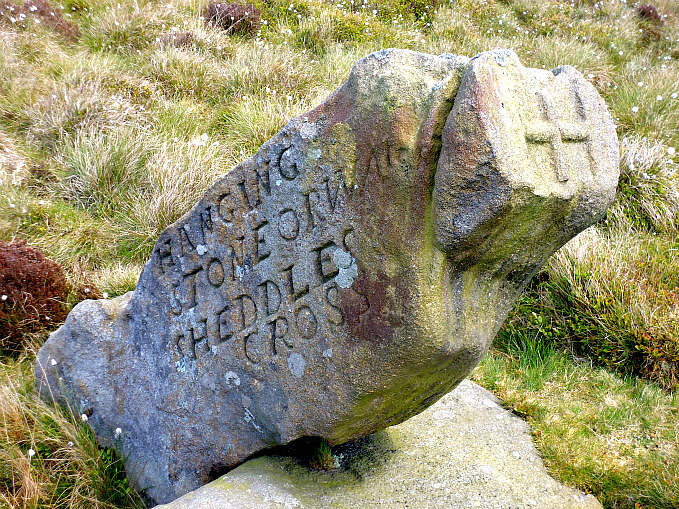 On the southern flank of Kiln Hill and overlooking the northern end of Watersheddles Reservoir, near Scar Top, is the Medieval boundary stone called Watersheddles Cross or Hanging Stone which, even today, marks the boundary between Lancashire and Yorkshire. The old stone now leans over at a considerable angle but is still recognizable for what its original purpose was; and maybe it was an ancient standing stone from prehistory. It has a rather crude inscription on one side with the name in large letters. 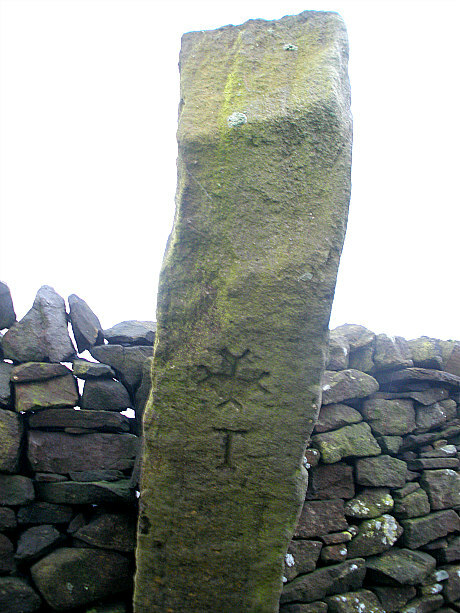 It is, though, uncertain why it also has the name ‘Hanging Stone’ and what that means with regard to the stone. 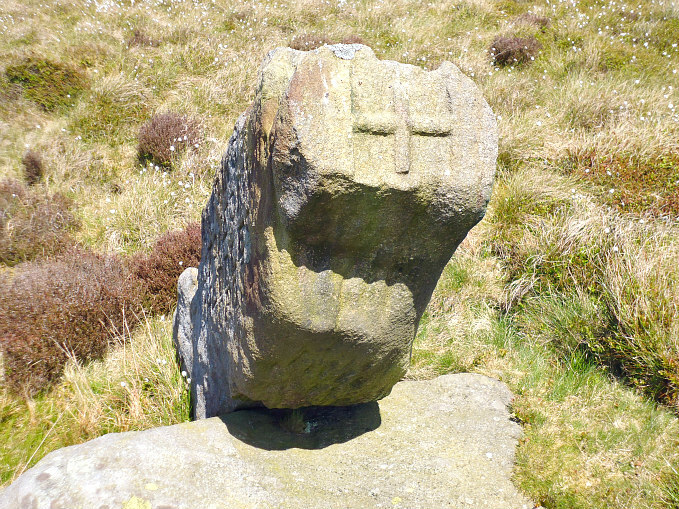 The cross can be reached from the little boundary stone on Two Laws Road – just after the reservoir and going towards Scar Top. Follow the wall up the moor on an undefined path to a metal gate, then continue up beside the wall until that stops and veers off in the opposite direction. You will see the Watersheddles Cross more or less in front of you. 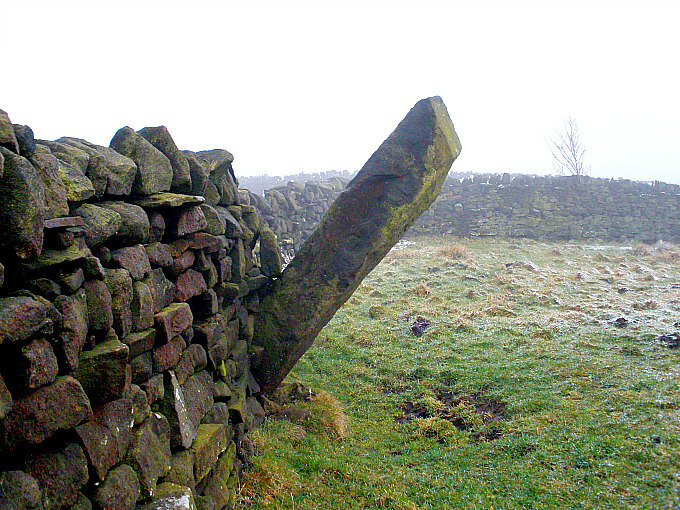 The Watersheddles Cross or Hanging Stone is a rough-hewn length of stone some 6 feet long that leans at a 45° angle or maybe more and is held in position against another lump of stone, with yet more lumps of stone at its base and surrounding it. It used to stand upright. Maybe long ago in the mists of time there was a wooden cross here, but this rotted away and had to be replaced by a stone one. This rough pillar of stone may have originated from somewhere else on the moor, and perhaps it had been a standing stone from prehistory, though whether it was we don’t know with any certainty. However, the stone was apparently brought to its present location in the 14th century and, sometime after that, probably after 1618, the large lettering on its west side carved onto it. The nice little cross at the top of the stone has obviously been carved more recently, maybe the 19th century, and the top part of the stone cut-away to allow for this. So “why” is it also called ‘Hanging Stone’ – that we don’t know, but there are many other rocks and stones that have this name. 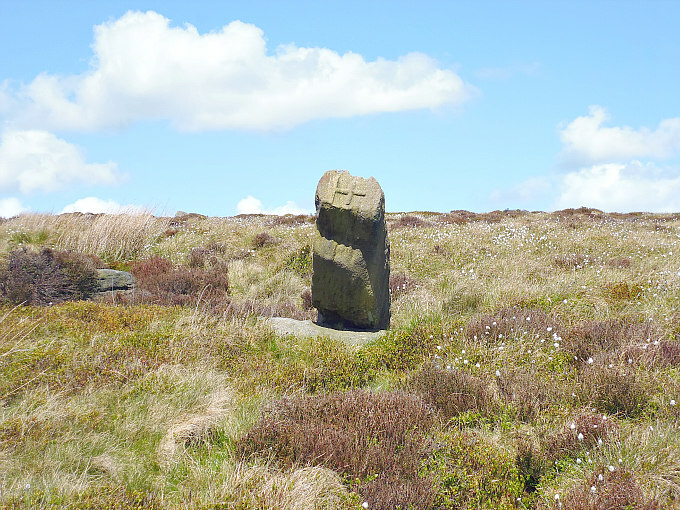 There are other boundary stones further up the moor to the north towards Wolf Stones, an outcrop of gritstone rocks which are visible from here. Categories: Ancient Crosses, Boundary Stone/Waymarker | Tags: Watersheddles Cross near Scar Top on Lancashire-Yorkshire border | Permalink.